We have a dreadful admission to make, we may have been cutting it bit fine opening up this morning. But we hope that when you hear our excuse you may forgive us. 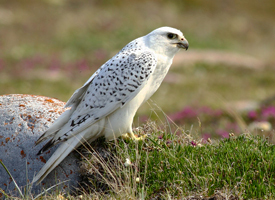 Yesterday we saw some exciting photographs on a friend's FaceBook timeline of a rare Gyrfalcon which had been spotted near the Brig O' Waithe in Stenness. This impressive bird is the largest of the falcon family and usually resident on Arctic coasts, so despite the recent wintry weather it is rare to find one here in Orkney. When we got a phone call this morning from someone in-the-know that the Gyrfalcon was still at large in a field just outside Stromness - and not far off our route to the library - we couldn't resist the chance to get a glimpse of this rare and distinguished visitor. The spot was easy to find as word had obviously spread quickly among the Orkney Twitchers and a collection of cars parked with varying degrees of care at the side of the main road led us to the correct spot. There sitting in the middle of a field was the Gyrfalcon, and very impressive it was too - although we're sure it would have been more impressive still had we remembered to pick up our binoculars as we rushed out the door! Luckily a local resident, who had come to investigate the source of the excitement, was better prepared and let us have a look through his binoculars, so we did get a good view of the exotic visitor in the end. I'm afraid we haven't been able to find any books describing the Gyrfalcon as its usual habitat puts it outside the range of most of our bird guide books. But to find out more about the world of Birdwatching we can offer you Everything you always wanted to know about birds ...but were afraid to ask!, A Bird in Bush: A Social History of Birdwatching and even How to be a bad birdwatcher . Being in a rush to get to the library we didn't hang around for long but were still glad of our hand knitted woolly gloves and hat. We hope those dedicated Birdwatchers, who seemed to be setting up camp for the day, were equally well provided with knitted warmth - perhaps we should have invited them along to Yap & Yarn?! 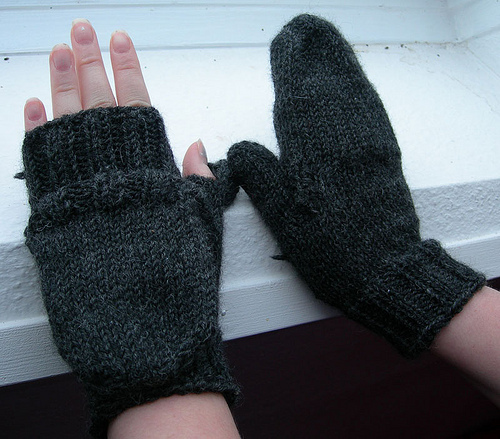 If you, or someone you know, is a Birdwatcher in need of some knitted warmth, why not come along on Monday, 4th February, when the Yap & Yarn group will meet here in the Stromness Library from 5-7pm. Just drop-in at any point within those times and you'll find help and encouragement with your project whatever it may be. If you're stuck for inspiration we have loads of books of patterns you can borrow and if you still can't find what you are looking for we can even help you get online where you will find a wealth of patterns, many available for free, on sites such as Ravelry. We came across the following pattern for Mobile Mittens which might be just the thing for cold hands which still need to work the focus on the binoculars! Lovely blog, Becky. Wish I'd seen the Gyrfalcon. Sounds like a character out of Harry Potter!